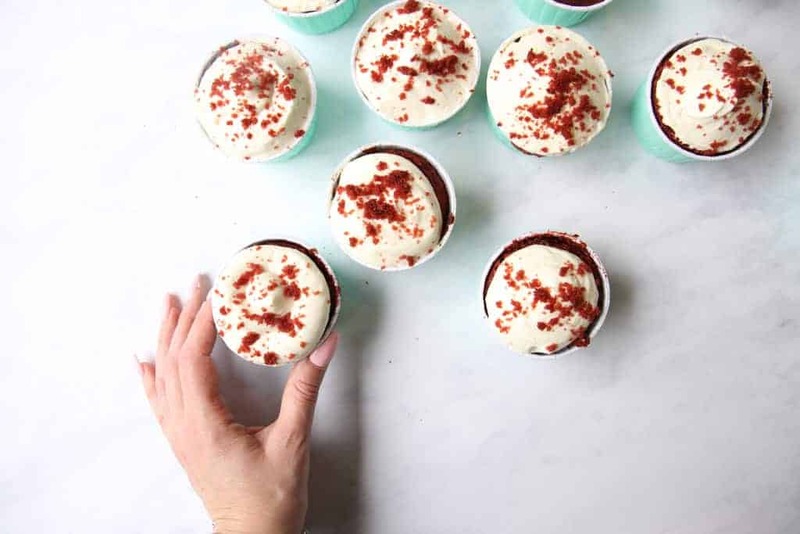 Weight Watchers Red Velvet Cupcakes are a perfect sweet treat and only 5 SmartPoints each! 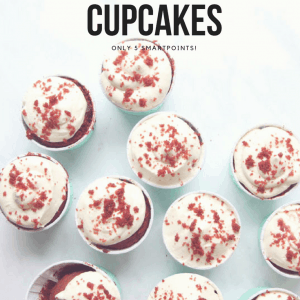 Beautifully red in colour, velvety soft, fluffy cupcakes, topped with a low-fat vanilla cream cheese frosting. Super quick and easy to make, you’ll be whipping up a batch in no time. I started my Weight Watchers Flex journey a couple of months ago, I’m still following it and have really enjoyed finding new and interesting recipes to try. I’ve got a couple of cookbooks that I’ve been working my way through and the Weight Watchers Red Velvet Cupcakes caught my eye. 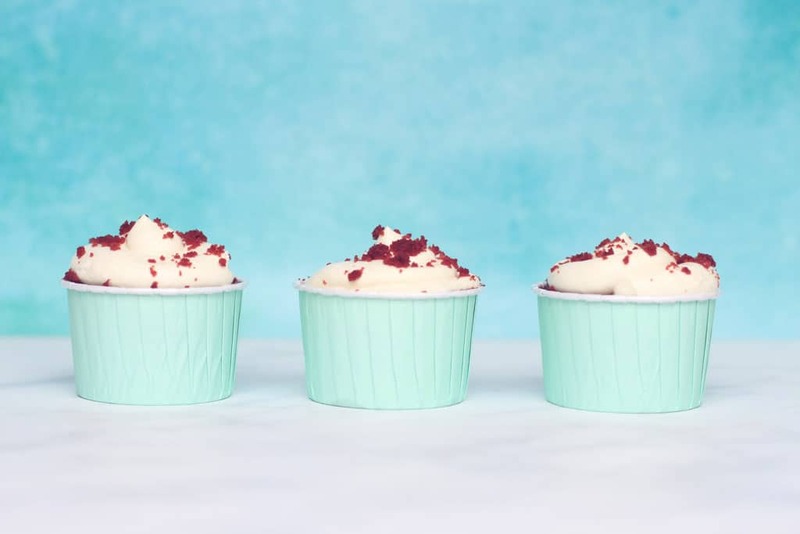 I had a hard time imagining how one of the favourite cupcake recipes would taste made the ‘skinny’ way, but I can tell you they are just as delicious as the regular Red Velvet, in fact, my family didn’t even ask if I’d switched from my usual recipe. Result! 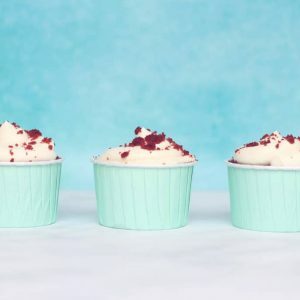 Red Velvet cupcakes have quite a distinctive taste, the addition of the cocoa gives it an almost-chocolate-cake-but-not-quite flavour and the vanilla cream cheese frosting compliments this perfectly. The vinegar and baking soda help the cake to rise and make the texture fluffy. The addition of yoghurt to this Weight Watchers recipe makes the sponge quite dense but it’s also light at the same time, it’s hard to explain but you’ll see what I mean as soon as you take your first bite! 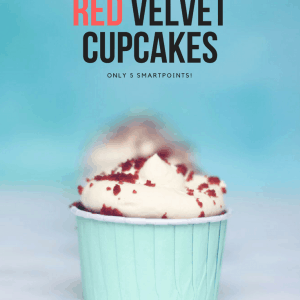 What makes Red Velvet Cupcakes Red? 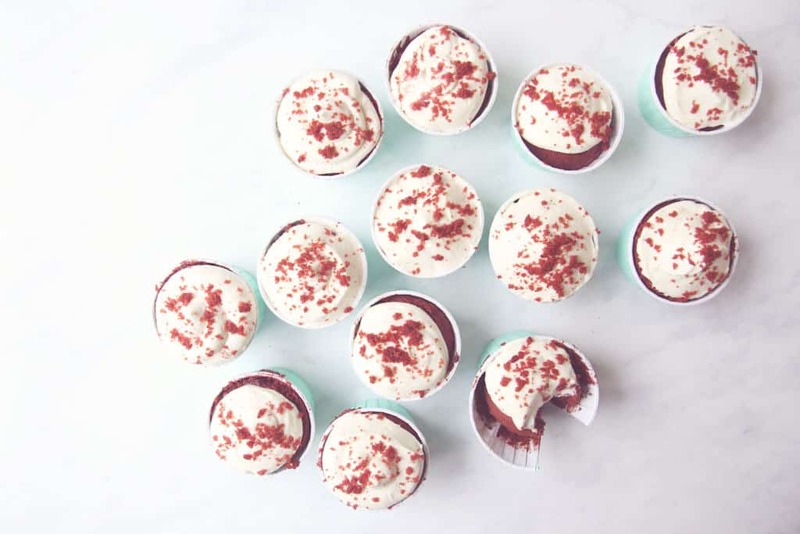 The addition of food colouring and cocoa powder gives Red Velvet Cupcakes their unique colour. During wartime rationing, people used beetroot to help keep cakes moist during baking which in turn enhanced the colour of the cakes they baked. 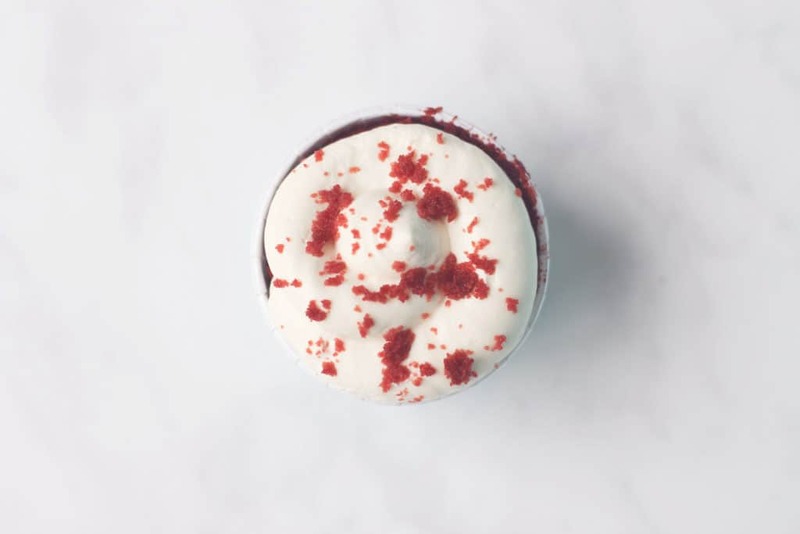 Red sponge has been around for a long time and has become increasingly popular in the UK mainly thanks to the Hummingbird Bakery who have people queuing in the street to taste their legendary Red Velvet Cupcakes. Let’s make Red Velvet cupcakes, shall we? The batter is easy to make, just follow the recipe card below and use these pictures to help you. A perfect sweet treat and only 5 SmartPoints each! 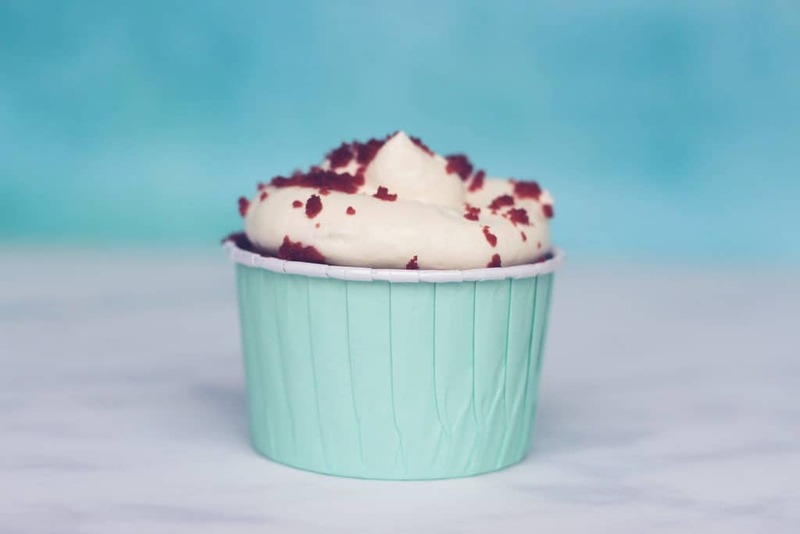 A beautiful red colour with a velvety soft and fluffy cake, topped with a low-fat vanilla cream cheese frosting. Super quick and easy to make, you'll be whipping up a batch in no time. Preheat your oven to 180°C/160°C fan/Gas 4. Line a muffin tin with 12 paper cases. Sift in the cocoa powder, add the whole tube of food colouring and vanilla and beat until combined. Divide the mixture between the cake cases, don't worry that they only look half full the mixture will rise when it bakes. Bake for 20 minutes or until a skewer inserted comes out clean. The cakes will be risen and springy to the touch. Once baked, cool in the tin for a few minutes then transfer to a wire cooling rack to cool completely. Trim the top of the cakes so they are level reserving some crumbs to decorate the icing with later. To make the frosting, mix the soft cheese, yoghurt, icing sugar and vanilla in a bowl. Swirl on to of the cupcakes with a piping bag and round nozzle if you have them, if not use a spoon to spread a dollop of frosting on top of each cake. Scatter with cake crumbs to decorate. For info on Weight Watchers, read Does the new Weight Watchers Flex Plan Work? Looking for a Weight Wathcers friendly recipe? Check out these amazing Pizza Tortillas and for more delicious cake recipes check out these Showstoppers and Cakes. 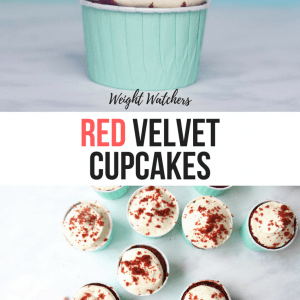 If you try these Weight Watchers Red Velvet Cupcakes, let me know. Leave a comment, rate it, and don’t forget to tag me @amytreasureblog on Instagram so I can see it! What an excellent recipe! Also very interesting facts about the origins of the red color in cakes- who knew! Those are so pretty and I love the step-by-step photos. They are calling out to me. Who could resist? Thank you, Jacqueline! They’ve been calling me from the fridge since I made them! 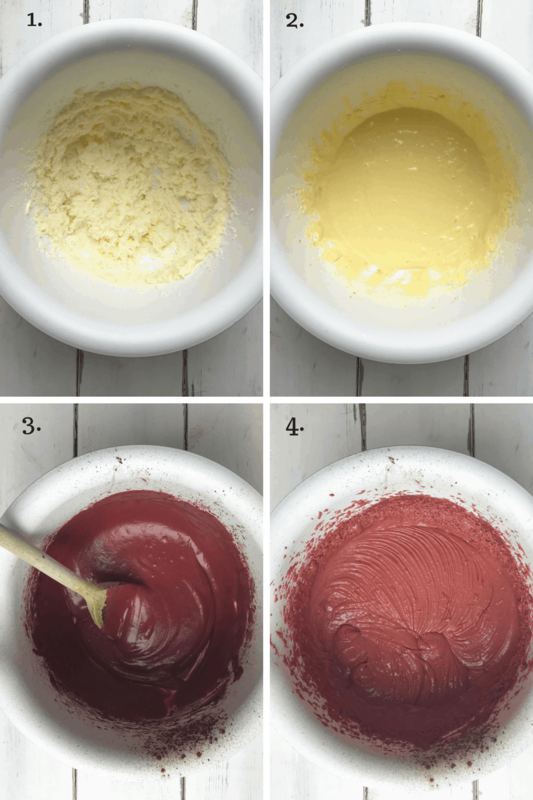 Love the step by step photos…and so interesting to learn about the origin of red color in cakes! Awesome and the cupcakes looks delicious ! I can easily incorporate this with my diet program too ! Such adorable cupcakes! I love how you crumbled additional red velvet cake over the frosting. So cute!